This series of posts are a big departure from my previous blogging. Why? Well, typically, I've kept my process tightly under wraps. As an artist, I've learned that I must protect, kindle, and give tender care to a new idea. Much like the time a seed needs to germinate before it can break through the darkness of the earth and reach toward the light. When an idea is shared with others during it's germination stage, especially those who don't fully support you or are more grounded in their own reality (and need to be right) rather than allowing room for anyone elses, ideas can be squashed and killed. Your gentle, fragile new baby can be reasoned away, all it's energy depleted and it dies. Gone is the baby with the bathwater. I thought that I needed to keep my design and pattern drafting portion quiet, unblogged until I had a garment ready. I worried that others would naysay and persuade me not to create what I proposed. I also watched how when I would share my early stage ideas too much, I would lose enthusiasm for them and never return to create them. But, something shifted when I read Brooks Ann's latest blog post about the Sewing Community and Resources. I really enjoy what she writes and shares about. I had a wonderful time getting to know her and several other wonderful people through Rachel's #SewPhotoHop. That made August an exciting month rather than one of droll existence awaiting September. August and January seem to be months that lack excitement in my life. The photo hop also brought out a huge amount of wonderful sewists and I very much enjoyed bonding with each person. My life is so much richer for having shared myself and connected with others over what they shared. Back to Brooks Ann's post... she talked about how many sewing bloggers simply share glamour shots of their finished piece and that wasn't necessarily as inspiring for her as other blogs were. That's what got me thinking. Who have I become as a sewing / artist / intuitive blogger? What do I want to achieve? Who do I wish to connect with? 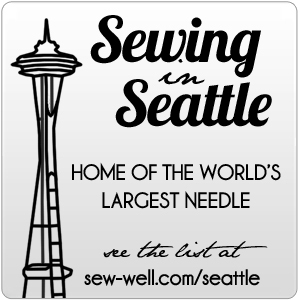 Why the hell am I blogging about sewing? Do I want to help others? Inspire others? Teach? Or simply share and say, "Look at me! Look what I made! Aren't I wonderful?" Now, I do love it when I receive praise for my completed works, but that's only a small portion of the equation. It's like the butter on the bread, the glaze on the cake. It's not enough to exist on for me. I've also given much thought to separating my artwork and my intuitive readings from my sewing. But, I spent years working in corporate america thinking that I HAD to separate myself. That I had to live one life as an engineer and another as a tribal belly dancer with a deeply thought provoking spiritual bent on life. I felt that couldn't be wholly me. So, my blog became the place where I got to exist as a whole unit. Then, in time, I began to live and breathe as the whole Gwen in my real life. I shared who I was and just let it be out there, allowing others to choose if they enjoyed my company or preferred others. I felt like my blog posts had become more about "look at what I made" and I can't share what's behind the curtain or you'll squash it. That wasn't what I wanted. So, with this series of posts, I'm taking a big leap of faith. I'm sharing what makes me tick, what gets me excited, how I will create a top by following my intuition and depart from the "rules". I'm showing you more of my messy drafting process - sharing what my thinking process looks like and how I arrive at my ideas. Why couldn't this be what inspires you? Why not let it be what it is? ​Here we go... I'd love to know if this winds your clock! Once I settle on a pattern or combination of attributes from each pattern, then it's time to settle in and trace out copies of all the necessary pattern pieces. In the past, I've just traced each of the aspects on a single pattern, rather than tracing each piece AS IS out of the pattern. However, that left me wondering as I began to sew about a seamline here, a notch there, an angle or otherwise. In learning from my past experiences, I now chose to trace all patterns. - connection points to the back neck instead of the collar in K2601(this allows for a lower neckline so I don't feel "choked"
- Side front bodice to waist (both allow me to introduce princess seaming that I know works for my bustline. Tracing takes time and patience. I enjoy a good movie with a good moral that supports the subconscious, like Chocolat with Judi Dench, Juliette Binoche, Johnny Depp, and Alfred Molina, while I trace. I also remember Kenneth King talking about how his pattern drafting teacher said that one should be able to trace curves by hand rather than relying on tools. This reminds me of what one of my most profound engineering professors taught us - be an Envelope Engineer. Know how to design, in the field, on the back of an envelope. Kenneth's drafting teacher is saying the same - figure out how to get it done and teach your muscles & brain how to recognize and re-create a curve quickly. So I'm using each opportunity to trace as a chance to train my muscles & brain to draw a curve. You know what - all those dotted lines? Traced by hand following the lines beneath. I feel pretty good. Because I used to be all over the place. So give it time. Once I finished tracing K2601 and pulled out all the other pattern pieces (they were already traced), then begins the pattern GRAFTING. I like to think of this like grafting trees. I'm creating new life, new garment by grafting together a vibrant varietal of fancy lace leaf maple onto a base maple (root stock) that is quite simple in nature. Over time, the gardener prunes away the base maple and allows the fance lace leaf to take over. What I'm doing with this combo of patterns is using the Shelf Bra Cami as my rootstock and all the other pattern pieces as my vibrant varietal. Make sense? I like to trace a lot of different pattern and design lines onto a single pattern piece. That helps me see where things intersect, where they don't, and unveils potential problem areas. It's very easy, though, to forget which line is which. And, it's even easier to just use whatever marker is closest. I recommend choosing one color for each pattern, then choosing another color to represent your modifications. In the tracing I've done here, I made the mistake of grabbing whatever was close. So, I also labeled each line with the pattern it originally came from. In the photo above left and below, the aqua line is the center back of bra in the shelf bra cami and the red line is the yolk to bodice of K2601. If I want to have that neat low back V, then I will need to give up a portion of the shelf bra. In the photo above right, the dark green V line represents K2601 actual yolk to back. The aqua lines represent the yolk of the shelf bra cami. I like the shelf bra cami yolk line, but one of the reasons I sought out K2601 is that it's lines appeared to fall deeper and more dramatically into the bust line. I want something that looks more flashy and will allow fringe to move (should I choose to add some). I was surprised that K2601 wasn't more severe when I overlaid all the pieces against the shelf bra cami. So, to add more drama, I lowered it by 1". Then, I thought I'd try a sweetheart line instead just for kicks. Sweetheart curves would give me a more feminine look rather than such a sporty look as the angles tend to do. When I overlaid Simplicity 4137, I could see how it offered more fullness in the bust and a better (tighter) fit at the underbust. Yay! However, it comes to a point above the bust apex and then relies on a strap. Whoops! Uh, how to incorporate that into this yolked design? Well, I knew that the sports bra I previously made from this pattern came up fairly high on my bust. And I knew that when I added powernet to the yolk of previous versions of the shelf bra cami, I had plenty of support, but that the existing shelf bra didn't quite give my upper bust (and at the apex) enough space and they were squashed rather than supported. So, I traced the bra up to the yolk, allowing the bust point to touch, but not cross over (you can see where I shifted the pattern to the side seam to avoid the crossing), then cut out anything in the bra above the yolk. After all this tracing, I also needed to re-walk the side seams to make sure that they would match up. I found the front to be about 1-3/4" longer than the back. That would allow for space in the bust, though I will need to ruche or add the darts from the shelf bra cami back in. This time, I think I'd like to try the ruching. After all is said and done, I must figure out where seam allowances need to be added back in or notches added for ease of construction. I'm getting really excited! Fringe is in my future along with a really wild print dance top! WOOT!